ErgoPrime is an innovative ergonomics consulting and training firm specializing in improving the performance of your workers and reducing the escalating cost of workplace injuries. Our focus is in designing work environments that will maximize the health, safety, and performance of your people. We provide office and industrial ergonomic assessments, Rapid-Return-to-Work services, customized injury prevention training for management and employees, physical demands analysis, audits, and ergonomic program development. ErgoPrime is owned and operated by Pam Grills MSc., CCPE and benefits from her twenty years of experience developing human performance solutions in challenging work environments. Based in Ottawa, we have been providing comprehensive ergonomic services to Eastern Ontario’s premier businesses and government organizations since 1998. No two workplaces are exactly alike. Our extensive experience ensures you will receive customized solutions optimized for your specific safety and business needs. We start by listening: learning how your business operates, assessing needs, and identifying ergonomic issues. We work with you and share our expertise to develop and implement low cost, high impact solutions that reduce the risk of injury and eliminate productivity barriers. We also follow-up to ensure that your ergonomic goals and expectations have been fully met. Our leadership, combined with our collaborative approach, is unique to ErgoPrime and ensures the success of your ergonomics projects. 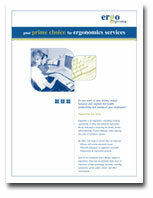 ErgoPrime’s reputation of expertise in the field of ergonomics is unrivalled. We have earned this reputation by consistently delivering high quality, comprehensive ergonomics services that improve health and productivity while providing a significant return on investment. ErgoPrime has a proven track record delivering cost-effective solutions that have saved our clients hundreds of thousands of dollars each year on their Workplace Safety and Insurance Board claims. Our ergonomists are experts in their field. They have accumulated many years of experience in high technology, electronic assembly, manufacturing, postal service, public sectors, and office environments. Our projects are led by a Canadian Certified Professional Ergonomist (CCPE). This accreditation is administered by the Canadian College for the Certification of Professional Ergonomists. It is the only recognized ergonomics certification in Canada, ensuring the competency of our ergonomists. You can be assured that our staff will perform a thorough analysis, identify the root causes of your ergonomic issues and provide you with a range of effective solutions, consistent with ergonomic standards/guidelines, best practices and research. Pam Grills founded ErgoPrime Inc. in 1998, and is a Canadian Certified Professional Ergonomist with over twenty years experience making workplaces healthier and more productive. She received a Masters of Science degree in Kinesiology/Ergonomics from the University of Waterloo and has extensive experience in both industrial and office ergonomics. Ms. Grills developed and managed a cost-saving ergonomics program for Nortel Networks in Ottawa, and lead Health Canada’s National Ergonomics Advisory Group in the development of their internal office ergonomics program. Ms. Grills has also been involved in returning injured workers to safe productive work, delivering ergonomics training and creating effective office work environments in the public and private sectors. Recently Ms. Grills made the Supreme Court of Canada Judges sit up and take notice of ergonomics by making their courtroom ergonomically correct...and more comfortable!